When it comes to having a proper meal, most of us prefer eating something made with fresh ingredients. But in today’s fast-paced world, lots of people quickly opt for the easiest, most convenient options for eating. And the moment we think about quick and easy ways of eating a whole meal, the first thing that comes to mind is the freezer. Whether it’s time constraints, calorie-counting, or budget considerations, you may resort to some of the frozen foods that are readily available at grocery stores. Frozen foods come in many varieties and cuisines, including Chinese, Indian, Mexican, organic, vegetarian, and low-calorie meals. Most can be prepared in about 10 to 15 minutes. Although frozen foods are super-convenient, there’s often a downside to them, not least of which is their nutritional value. Hence, you must pay attention to what exactly you’re buying before filling your care with frozen meals. Here we’ve highlighted a few useful tips, which will help you choose some healthy (and tasty!) frozen foods. Always read the labels. Before buying frozen foods, read the labels carefully. One of the main things to look for is the amount of fat content in that particular item. The recommended value of fat content per serving for any of these frozen foods should not exceed 10-15 grams. If the label includes some scientific terms that you’re not familiar with, it’s better to avoid the item until you’re sure of the ingredients. Avoid added ingredients. Frozen foods with added ingredients like rice, sugar or cheese may not be a good option. These extra ingredients often increase the fat and/or sodium content in the frozen meals. 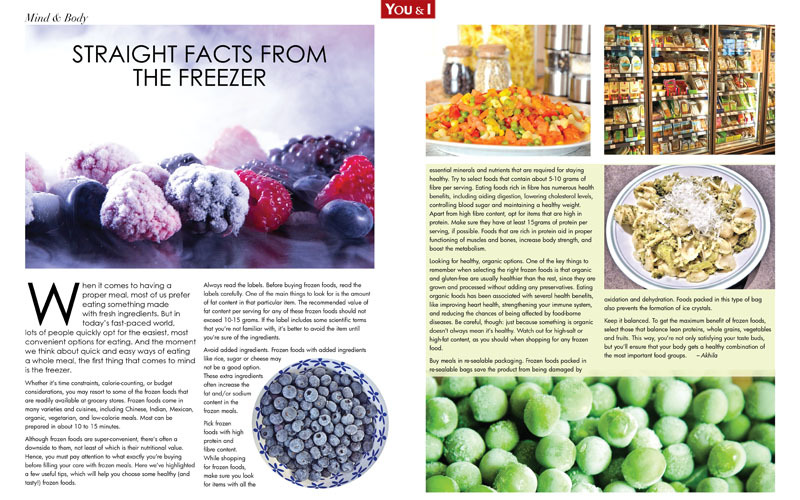 Pick frozen foods with high protein and fibre content. While shopping for frozen foods, make sure you look for items with all the essential minerals and nutrients that are required for staying healthy. Try to select foods that contain about 5-10 grams of fibre per serving. Eating foods rich in fibre has numerous health benefits, including aiding digestion, lowering cholesterol levels, controlling blood sugar and maintaining a healthy weight. Apart from high fibre content, opt for items that are high in protein. Make sure they have at least 15grams of protein per serving, if possible. Foods that are rich in protein aid in proper functioning of muscles and bones, increase body strength, and boost the metabolism. Looking for healthy, organic options. One of the key things to remember when selecting the right frozen foods is that organic and gluten-free are usually healthier than the rest, since they are grown and processed without adding any preservatives. Eating organic foods has been associated with several health benefits, like improving heart health, strengthening your immune system, and reducing the chances of being affected by food-borne diseases. Be careful, though: just because something is organic doesn’t always mean it’s healthy. Watch out for high-salt or high-fat content, as you should when shopping for any frozen food. Buy meals in re-sealable packaging. Frozen foods packed in re-sealable bags save the product from being damaged by oxidation and dehydration. Foods packed in this type of bag also prevents the formation of ice crystals. Keep it balanced. To get the maximum benefit of frozen foods, select those that balance lean proteins, whole grains, vegetables and fruits. This way, you’re not only satisfying your taste buds, but you’ll ensure that your body gets a healthy combination of the most important food groups.